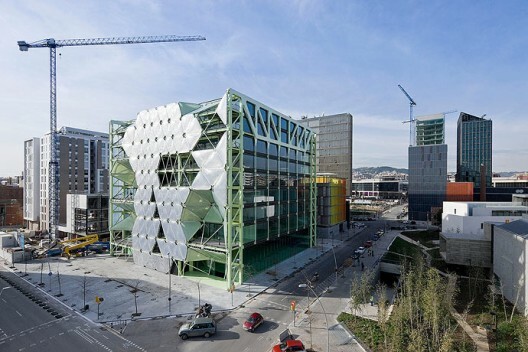 The building is in the shape of a cube and formed by large iron beams covered in a plastic coating of inflatable bubbles, which offer glimpses of the fluorescent structure of the building. The attractive covering also has a functional utility as a way of regulating light and temperature, primarily preventing 114 tons of CO2 a year from escaping from the building, and offering a 20% saving on climate control. Every facade of the Media-TIC is different: from the outside, they reveal parts of their interior spaces and give a diverse plasticity, while from the inside they offer spectacular views. Importing enviroment data from Arduino to Rhino and other 3D programs has become easier with the creation of [GrassHopper] and its practical toolbar [FireFly]. Firefly for Grasshopper / Arduino from Jason K Johnson on Vimeo. New ways to conceive our spaces, a new use of energy, the upcoming concept of [active houses] are just around the corner. My question is: how can we get rid of 50 years of misuse (misunderstanding?) of architecture? A new age is coming, maybe.